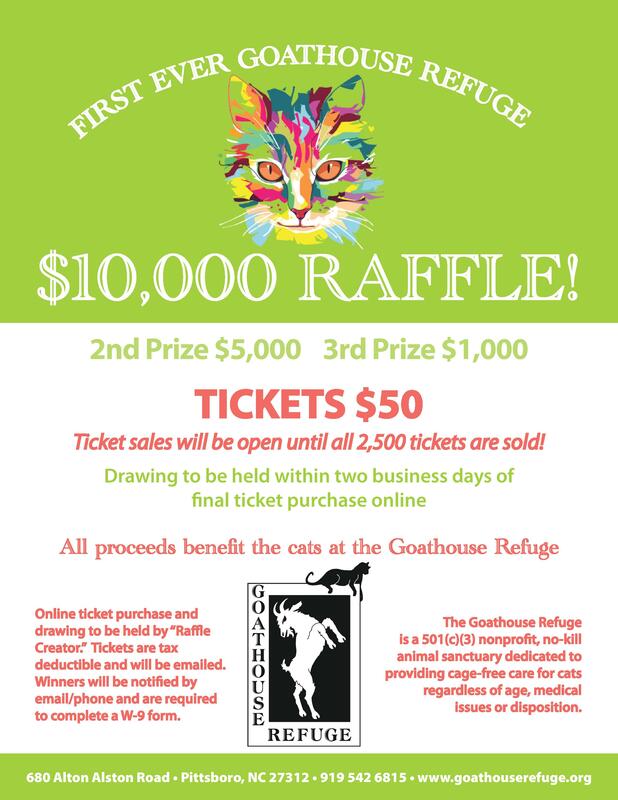 The Goathouse Refuge is a nonprofit temporary home to nearly 300 cats who have been rescued from abandonment, homelessness and high-kill shelters in and around our area. 30-40 cats per month are adopted from us into loving homes. During their time with us, we rely solely on the donations of our supporters for money to purchase food, provide shelter, purchase medications and also to pay for vetting, vaccinations and spay/neuter costs necessary for each kitty. Those expenses alone take an extraordinary amount of money---about $40,000/month!!! We now have some major expenses being required for our facility including digging a larger well due to development around our acreage, tree removal from Hurricane Florence and other significant maintenance improvements that are costly and above our normal operating expenses of caring for the cats. This fundraiser is designed to take care of these huge expenses so our facility can continue to provide a safe and wonderful place for at-risk cats and kittens for years to come.